Just wanted to take a moment to honor all our fallen heroes over the years. From those brave men who went to war against a superior army, better trained, better outfitted, better fed and better armed, to secure our freedom in 1776, to the young men and women who lost their lives this past year in Afghanistan and Iraq, and all those in between: The Civil War, WWI, WWII, Korea, Vietnam, the middle east and all the other skirmishes where freedom was on the line. You are not forgotten and your sacrifices are remembered and honored, at least from this small piece of our great country. God bless you all. And God bless America. I went to the St Augustine Air show today. What a great combination of old fashioned barnstorming and 21st century jets. I loved every minute. It began with the national anthem sung by a local young woman who did a far better job than anyone's done at the Super Bowl in recent years. While she sang and the assembled crowd stood, the Misty Blues (a 4 woman skydiving team) jumped from an airplane and arrived on the ground with the American Flag. 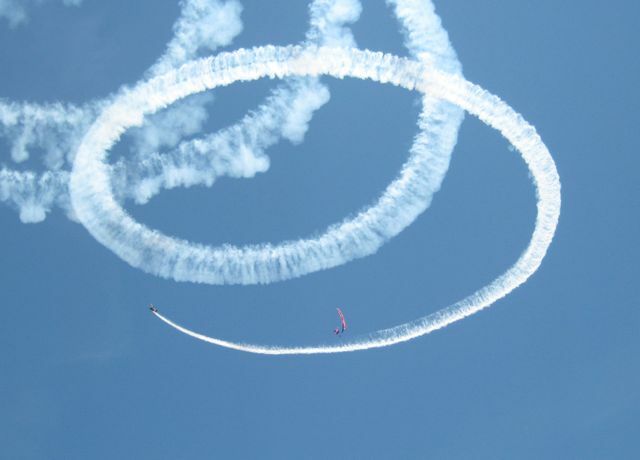 While the woman with the flag was descending a little stunt plane flew loops around her. Very impressive! There were bi-planes, both old and new, lots of great stunts and an exciting new five member team of jets, one solo and four who flew in formation. The jet propelled truck everyone seems to think so highly of, although I have to admit, it wasn't in the air and didn't much interest me, was there as well as a Hollywood creation called Robosaurus that woke up and crunched a car for breakfast. That didn't much impress me either but the kids loved it. It was twice as big as the T-rex was once upon a time. 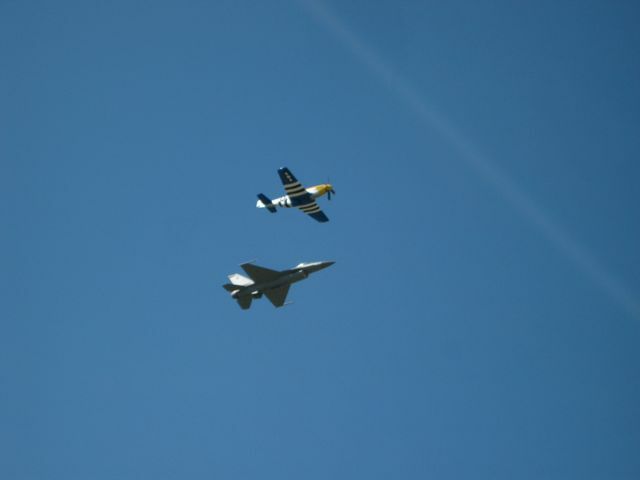 The show ended with a heritage flight of two planes, one a prop plane (P-51) and one a jet (F-16) who flew together and solo. All in all, a really great air show. As I watched the shuttle Endeavor streak into space today, there was a touch of sadness that I would never get to witness this amazing event again. (There is one more shuttle, but it's now scheduled for July when I will be away.) There was also a touch of awe when I consider the sheer audacity of this program. On space travel in general. I pictured those men, sitting atop a gazillion gallons of fuel, confident in their ability to harness the raw power of those rockets and ride that machine to the space station and back. it must take a special kind of courage, especially those first launches, but even the ones that happen today. The rest of the world probably takes it for granted, especially the younger generations who don't remember the first sub-orbital launch, or the disasters of the Apollo program. What courage it must have taken for the men of Apollo 7 after their fellow astronauts had died in a test, or for the crew of the flight that followed the explosion of the Challenger. Somehow, we take it all for granted today, but it must still take an enormous amount of courage and faith. So, with those thoughts in mind, I watched the fiery streak in the bright morning sky, said a prayer for the crew and was awed all over again. But then I remembered the less awesome facts. That this is the end of an era. I realize that the end began with Bush who was more interested in Mars and a return to the Moon. I also know that Obama at least gives lip service to exploration of Mars, but is that the whole reason the shuttles will end? We are in a serious bind financially and an argument can be made for the fact that it will be cheaper to send our astronauts to the space station aboard a Soyuz rocket, but the cost is still $63 million - that's 63 million US dollars going into Russian pockets instead of American ones. How many jobs will be lost? Not just the NASA crews, but the all the technicians, the computer people, backup support, dietitians, doctors, the people who sweep the floors and clean the toilets in Florida and Houston, but all the businesses that have grown up around the NASA complexes, the restaurants, the hotels, the 7-11 stores, gas stations, housing developers, you name it, the list is endless. How many of those people are going to find themselves out of work while we pay the Russians $63 million to send our men into space? The other distressing thought that occurs to me is that we will no longer have direct access to the space station we have spent trillions of dollars to build. Can we be absolutely guaranteed that the Russian Bear will never view this as their opportunity to regain their dominance on earth by turning away from peaceful exploration and turning the space station into a platform of war. I will admit, I don't have all the facts, nor do I understand all the ramifications of this decision, but to this observer at least, ending the shuttle program seems to be a poorly thought out plan. 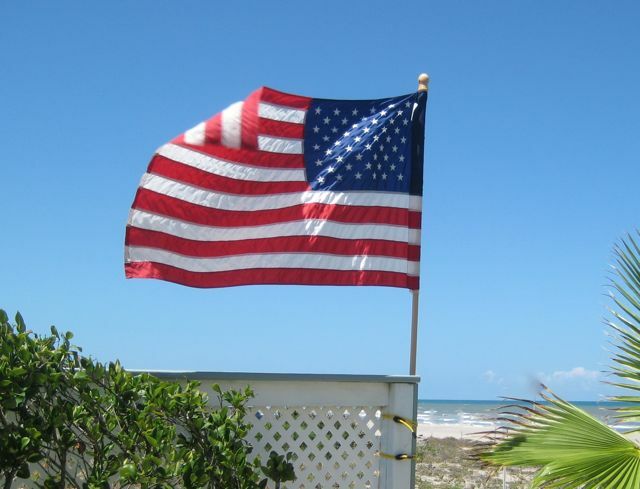 I will miss watching the intrepid NASA fliers blast off into space from Cape Kennedy, but I will miss even more the idea that America was the leader here for so long and is no longer. I'm still getting my head wrapped around the fact that I actually live here in my piece of paradise on a permanent basis. Summer was always my favorite season and while there is appeal in the crisp clean air of fall with the glorious color of changing leaves, a renewal of hope in the spring when buds reappear on everything, as well as snow to play in in the winter, summer never seemed to last long enough. When I was a kid, I suppose the end of summer also meant a return to school and a loss of the freedom summer meant. But even as an adult when I was a stay at home mom and my kids were the ones heading back to school leaving me more time to myself, still summer didn't last long enough. I loved those long warm evenings, the heat of the sun beating down on my head, and the gentle wind of summer. Flinging myself off the dock into the cool water of the lake, riding my bike down sun-dappled roads, exploring the woods, lush with green growing things, or just the long, seemingly endless days. I even savored the oven like feel of my car when I first climbed into it after it had been parked in the sun for any length of time, and the hum of insects in the air. I just plain loved summer. But in New England, the summer never lasted long enough. The first time I had to put on a sweatshirt in the evening brought a feeling of sadness because I knew winter was on its way and it would be a long time before summer rolled around again. The older I got, the longer winter seemed to last. Part of that might be blamed on having moved even further north to Maine. Nothing is more glorious than Maine in the summer and fall, but winter begins almost as soon as the colorful leaves have been blown off the trees and lasts well into April, often even through May. It turned out spring was an illusive season that often never arrived at all. Some folks said Maine had four seasons, Summer, fall, winter and mud. Mud season lasts from the last snow through the thawing of the ground until the temperatures abruptly shoot into the 80s and summer seems to have arrived with no warning. Then summer itself seemed to last only a few swift weeks with the first bright red leaves appearing even as early as mid-August. So, here I am in St Augustine where summer lasts for at least nine months and the other three seasons are crammed into three mild months that often have snatches of summer-like weather here and there. And I still have a hard time feeling confident that I'm not wasting a precious summer day when I have to be in a meeting all day, or spend the day in and out of the car getting errands done. Traveling north to visit family always seems to coincide with their coldest spells regardless of the season and I'm still feeling like I might miss some of my summer. I suppose eventually I will become accustomed and stop worrying about squandering the warm sunny days, but I hope I never lose my appreciation for the wonder of summer days or the fact that I enjoy so many of them here in my new Sandcastle by the sea.